Please note that the amounts in the recipe for poached pears are approximate. 1. In a deep medium saucepan, combine the wine, water, and sugar. Split the vanilla bean; scrape the seeds into the saucepan and add the entire bean. Add the cinnamon sticks and cloves. 2. In a food processor, puree the extra ripe Anjou pears. Strain the puree through a fine sieve into the wine mixture in the saucepan. 3. Bring the contents of the saucepan to a boil and then reduce to a simmer. 4. Meanwhile, use a melon baller to remove the center of the seckel pears, starting from the bottom. Peel each pear. 5. Once the wine mixture has come to a simmer, add the seckel pears. Cook at a simmer until done, about 10 minutes, depending on the original firmness of the pears. 6. Strain the pears from the liquid once they are done and set them on a cooling rack to cool and drain. Keep the remaining poaching liquid in the refrigerator for future use. 1. In a food processor, combine the almonds and flour. Grind finely. 2. Add in sugar, butter, and flavorings. Blend. 3. Finally, blend in the eggs until the mixture is smooth. 4. Allow the filling to rest in the refrigerator for two to three hours. 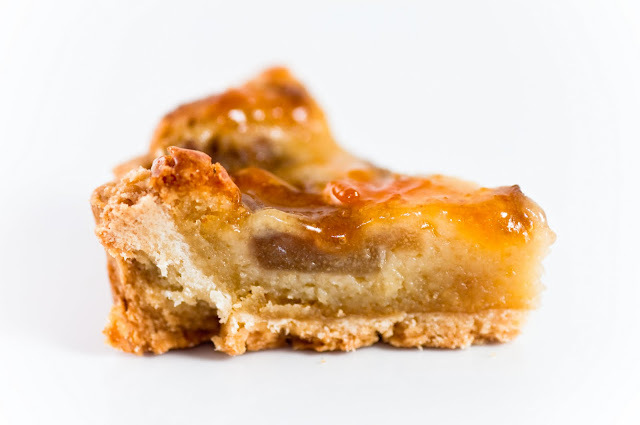 This is my go-to sweet tart pastry recipe, with a hint of almond added especially for this tart. I even have to resist eating the dough raw! 2. Combine all ingredients in a food processor. Blend just until a dough begins to form. 3. Remove from food processor and place the dough on a floured work surface. Knead gently just until the dough comes together. Chill if the dough is too warm. 5. Chill the dough for about 20 minutes in the freezer. 7. Bake in the oven for about 15 minutes until almost done. Remove and let cool. 2. Spoon the frangipane filling into the baked tart shell and smooth. 3. Slice the poached pears thinly and arrange on top of the frangipane filling. The filling will puff up during baking, so keep that in mind when you make your pear arrangements. 4. 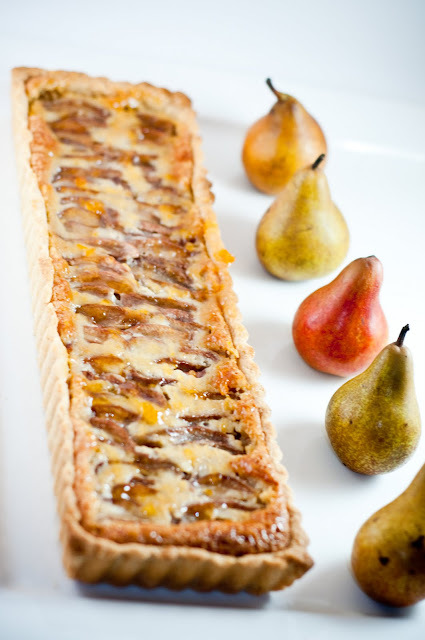 Bake the tart for 40-50 minutes, until the frangipane is puffed and firm to the touch. 6. Heat the apricot jam in the microwave until it is liquid. 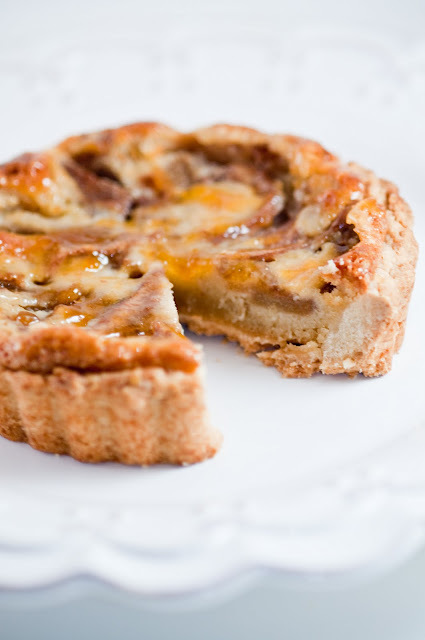 Using a pastry brush, brush a thin layer of glaze onto the tart. I've got some pears and apricot jam. I think I'll try this. It looks really good! This looks really amazing. 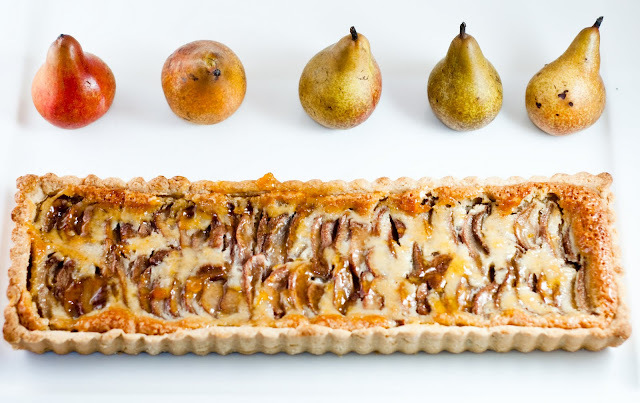 Lovely tart ... the crust looks perfect and the drunken pears sound to die for! Wowee!! Beautiful pictures and tart! Thanks, everyone, for your thoughtful comments! @Mrs. B: if you try this, please let me know how it turns out!